An axle counter acts as a counting head, detecting all the axles of rolling stock travelling on a track and also their direction of travel, using two electronic wheel sensor systems. In the most modern railway lines, at the start and the end of each block section, equipments called Axle Counter (or Axle Counting System) are placed. An axle counter acts as a counting head, detecting all the axles of rolling stock travelling on a track and also their direction of travel, using two electronic wheel sensor systems. By comparing the result for the axles counted in with the result for those counted out, it is possible to know the status of the track section (Free or occupied) . Referring to the picture below, until the number of axles counted by the Axle Counting System Ax2 (train exting from TS1) is not equal to that counted by the Axle Counting System Ax1 (train entering in TS1), then the track section TS1 shall be considered “occupied”. For Wheel detection is intended the service which aims to provide digital pulses indicating the presence, the speed or the direction of an axle. 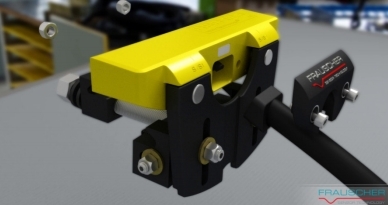 What we are asking ourself today is “What’s the current state of art for these technologies?” An answer can be provided by the company “Fraucher Technology”, specialized in movement sensors.